Denver Stained Glass custom designs and locally builds each window. We can create a piece that matches the styles that you’ve already incorporated into your home, and that you truly love. We specialize in a wide array of design styles to accommodate our wide array of clientele. 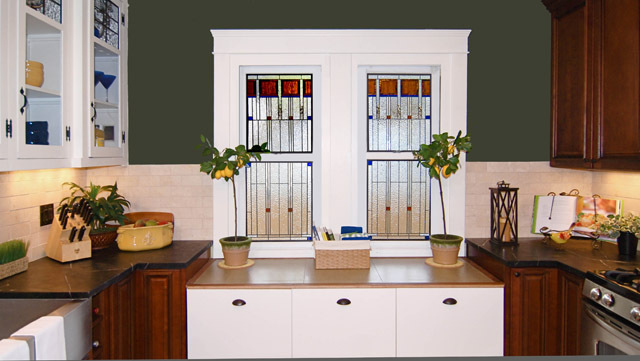 Scottish Stained Glass Denver provides custom stained glass designs for any style of home. We take great pride in our detail oriented ability to tailor our designs to individual clients and their taste. No matter what your vision for your new stained glass window may be, we will help your turn it into a reality. We have worked with a wide variety of clients and created countless pieces. Our experience has led us to become very familiar with all design styles, allowing us to better serve every Scottish Stained Glass Denver client. Since we have limitless design opportunities, though, it is best to narrow down your individual style in order to create the perfect design for you. Some of the more prominent design styles we have worked with include Mission, Frank Lloyd Wright, Art Deco, Art Nouveau, and Mackintosh. Traditional stained glass windows can be interpreted in a variety of way. Typically, one pictures traditional stained glass to be colorful and bright, or like church stained glass. However, traditional stained glass can be created using all clear, leaded glass too. By using leaded designs, we can create the traditional style you’ve been hoping for, but still offer you a choice that will flow with the look of your home. Contemporary stained glass is another broad category for design styles. Generally, contemporary designs incorporate art deco and mission style characteristics. They are often linear, simplistic, clean, geometrical, and somewhat abstract. Accents of color in contemporary windows can really help them to come together. No matter what style fits your unique home, we are able to accommodate your needs. If you’re looking for more contemporary looks, or a traditional floral design, just mention it to your designer. Our expert team is made of experienced designers who have helped thousands of clients find their perfect leaded glass style, and we want to help you find yours! We offer over 600 color options, and many textured and bevel choices to help make your design come to life the way you’ve always envisioned it. Let us show you how adding stained glass to your Denver home can become a unique outlet for you to express your own personal style. Make your living space completely your own with our custom product. Feel free to give us a call or send an email if you have any questions about the different styles we can offer you, or to set up a consultation with one of our talented designers. Scottish Stained Glass serves all of Denver, and we can’t wait to get started on adding our high quality custom stained glass to your Denver home today!